A comprehensive manual that is creating quite a stir in the surveying community. It examines the systems available for data capture and photogrammetric processing and provides an opportunity for readers to apply photo-interpretation, reconnaissance and photomapping techniques to many planning, resource harvesting, pollution prevention, civil engineering, disaster mitigation and containment requirements. Included within the 12 chapters are the principles of digital systems, digital aerial photography, cameras, survey-camera mountings, survey navigation, GPS and (d)GPS systems. In addition there is sound coverage of soft-copy photogrammetry, ground survey control and a final chapter devoted to typical digital air surveys worldwide. A brief history of aerial survey; Principles of digital aerial photography; Sensors for aerial photography; Digital camera systems; Digital cameras for aerial photography; Survey aircraft, camera mounts and intervalometers; Survey flight management: tracing, GPS, mission planning; Digital survey planning and logistics; Photo-interpretation, objective analysis and image quality; Ground control acquisition; Principles and methods of digital photogrammetry; Digital survey missions: profiles and their applications; Appendix A: Unit conversions; Appendix B: Binary and ASCII codes; Appendix C: Suppliers, manufacturers and institutes; Appendix D: Air survey computer programs; Glossary; Bibliography; Index. Professionals and students in surveying, photogrammetry and remote sensing; anyone involved with aerial survey; those who can benefit from the technique in civil engineering, geology, GIS, planning, forestry and much more. 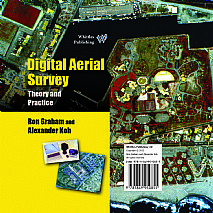 'This is a valuable source of information on digital camera technology and its application to aerial survey....The book also records some valuable experiences of users of digital cameras and imagery from a variety of airborne platforms. The explanation of both the theory and practice contain a vast amount of technical detail well supported by diagrams and a collection of high quality colour photographs including a number on an accompanying CD.